Abraham Peter Regier, better known to his friends as “Ed”, was one of the most dedicated pioneers of the credit union movement. In 1944, Ed and his wife Margaretha along with their nine children moved from Alberta to the small farming community of Virgil. It was that same year that Ed founded the Niagara Township Credit Union. People of the community had been trying for many years to have a bank branch established in their community without success. It was Ed’s suggestion that the local people band together to form their own financial co-operative. As a result, the “Niagara Township Credit Union” sprouted in 1944, with assets of $24. At the end of its first year of operation, membership totalled 63 and assets were $2,421. Ed continued to serve as the Manager until his retirement in 1965, but continued to play an active role in the credit union’s growth until his passing at the age of 100 in 1995. During the early 1950s, the credit union expanded, opening a new branch in St. Catharines, allowing many more members to join the credit union, spurring growth. In 1955 Ed spent two hours convincing a young Bill Goertz to help with the operation of the Virgil branch for $60 a week. When Bill reported for work, he found papers and boxes piled high in one corner and a dilapidated adding machine that had only enough keys to ring up a total of $9,999.99. Bill became a jack-of-all-trades – he was a teller, a posting clerk, a loans clerk and he cleaned the floor…back then it was called good training. Bill became CEO of Niagara Credit Union in 1965 and saw the credit union grow from 500 members and $300,000 in assets to 63,000 members, $660 million in assets and 14 branches in 1993, when he retired at the age of 63. At the time of award, NCU managed over $1.5 billion in assets, owned a 20% share of the banking market in Niagara, proudly served almost 90,000 members, and was a local corporate leader. Through all of this growth, NCU has never forgotten its roots, and continued to “grow lives” through exceptional personal service and community investment. 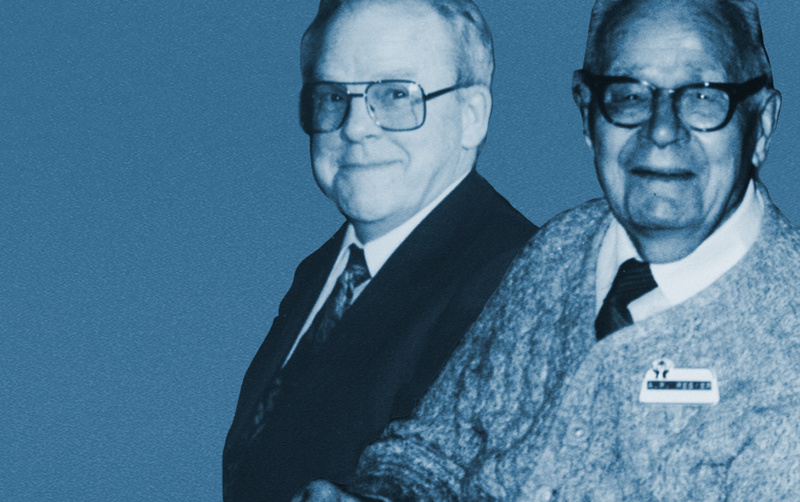 From humble beginnings, Niagara Credit Union’s success during the past 58 years has occurred for three reasons – the loyalty of its members, the dedication of its staff, and the foresight and commitment of its two pioneers – Mr. Ed Regier and Mr. Bill Goertz.